Mouse Glycophorin A, His Tag & Fc Tag (CDA-M526x) is expressed from human 293 cells (HEK293). It contains AA Met 1 - Val 108 (Accession # P14220). This protein carries a human IgG1 Fc tag at the N-terminus and a polyhistidine tag at the C-terminus. The protein has a calculated MW of 39.6 kDa. The protein migrates as 60-66 kDa under reducing (R) condition (SDS-PAGE) due to glycosylation. Mouse Glycophorin A, His Tag & Fc Tag on SDS-PAGE under reducing (R) condition. The gel was stained overnight with Coomassie Blue. The purity of the protein is greater than 90%. Glycophorin-A, a member of the glycophorin-A family, is also known as CD235a and Gypa, which is heavily glycosylated on serine and threonine residues at the N-terminal extracellular domain. 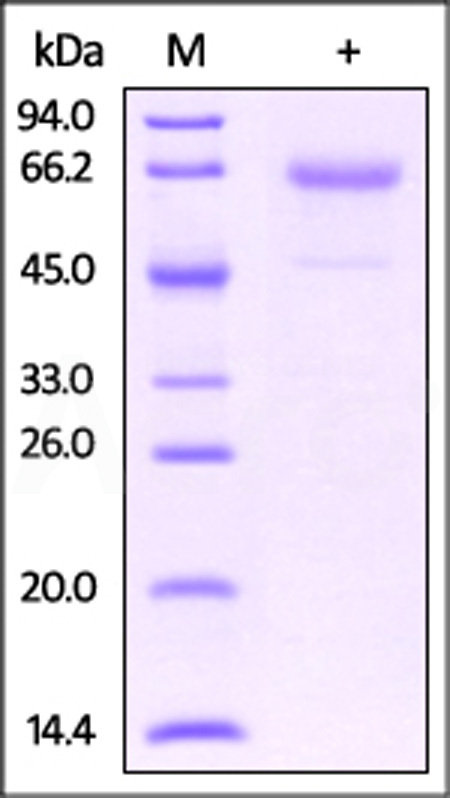 CD235a,a single-pass type III membrane protein,is the major intrinsic membrane sialoglycoprotein of the erythrocyte. Also,CD235a appears to be important for the function of SLC4A1 and is required for high activity of SLC4A1. Furthermore,CD235a may be involved in translocation of SLC4A1 to the plasma membrane. (1) Arimitsu N., et al., 2003, Genes Cells 8:769-777.